Connected objects are Natural Born Storytellers -and- meaningful stories might be created with the right combination of automatic contributions coming from objects’ sensors with “low resistance” / commons habits from humans. Some of these objects below are made of materials that transmit us a specific feeling. Some others are telling us stories trough their physical design –or- specific features. Definitively each of them communicates to us leveraging the brand. Sometime because their own nature, and mostly because we –humans- relate our experience with objects, we might say that these OBJECTS ARE ALREADY TELLING US STORIES. So, when objects become true storyteller? According Paola Antonelli, Senior Curator @MOMA NYC, it provably happen in 2011, when she come out with the TALK TO ME exposition. Personally I am not a super fan of Paola and I don’t think it was a perfect exposition, but I see it was really significant. Talk to Me explores the communication between people and things. All objects contain information that goes well beyond their immediate use or appearance. … Whether openly and actively, or in subtle, subliminal ways, things talk to us, and designers help us develop and improvise the dialogue. The MOMA exposition was about Art and it makes sense, because they are focused about Art. Personally I am more interested in design and technology and -in those fields- objects noisily started to “talk” to us when the “Internet of Things” encountered the wearable devices emergent market. Simple bracelet like UP from Jawbone, are the perfect example of things that starts to record what we do every day. This extended memory, visualized through dashboard, is able to make our behavior measurable and more understandable. Thanks to these systems, “we actually saw what we do” and –influenced by the reality photographed by the device- we might find the motivation motivated to evolve our behaviors in a positive way. Measuring is ever the first step. Visualising information in a meaningful way is already a first picture of a story. However, if we isolate the storyteller things to the unidirectional information flow from the device to the dashboard, we can’t say to be in in presence of a true storyteller. In fact, a relevant part of this new kind of story is the audience. I personally see very few consistent stories were the connected object talk just with the owner. Connected objects are usually smart enough to play a behavior. For example, take a detection (measure something) each time that a trigger is ON, or every X minutes, etc. When a connected object is designed to share their “discoveries” trough the same social network where the humans lives, the story begin to work. In fact, connected objects that are designed to run automatic behaviors, and share their detection –in a meaningful way- on socials, are candidates to be storytellers. Automatic memories might be very powerful. The information pollution combined with emergent multitasking habits, might make your day very complicated. We all need more memory to take care of the thousands of interactions we run every day, but that’s happen exactly while –as humans- we are outsourcing our memory (phone numbers, to do list, recipes, etc.) into the cloud. Beyond Motorola concept, many others explored this idea to record… life. It was about 2005 when Microsoft jumped into this space with SenseCam project. 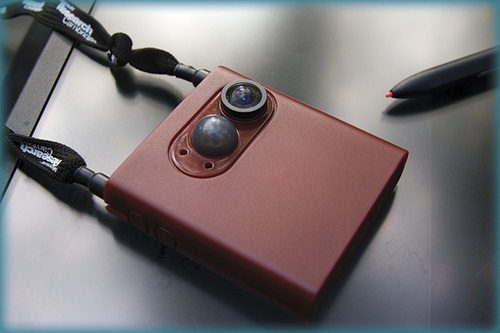 SenseCam is a wearable camera that takes photos automatically. Originally conceived as a personal ‘Black Box’ accident recorder, it soon became evident that looking through images previously recorded tends to elicit quite vivid remembering of the original event. This image above is another life recorder; provably the strangest wearable of last years. Introduced –as concept- in 2008, Momenta starts from the idea that seems inevitable that we’ll eventually all record our live digitally. “If you’ve ever thought, "I wish I had that on tape”, when everybody is laughing themselves to tears, Momenta has already captured the previous five minutes in its rolling buffer and continues to record until you tell it to stop. Triggered by increased heart rate, it captures those hilarious or exciting moments that are usually lost forever". “Automatic memories” took by the photo/video camera are actual as never before. The Life Recorder in the example allows users to recall people identity and information. Today we might consider it also ludic and enjoyable; In synch with selfies habits. Life recorders might certainly aspire to be storyteller, also if they are totally not smart enough and definitively “not conscious”. The next step to be a storyteller might be to evolve as a companion. Jibo it look not only able to respond to voice interaction (like Google Glasses for example) but also takes actions considering the context. For example “understating” who is in the room, or when it might be the right moment to notify a reminder. Cynthia Breazeal –Jibo’s mam- declared that her interest in robotics bloomed the first time she saw Star Wars in theaters as a 10-year-old. And certainly she wasn’t the only one. The idea to build a companion robot has already a long story. Thanks to all robotic dogs, rabbits and dinosaurs we saw during last ten years, the idea of an autonomous companion is flourishing. For example –in 2005/2007- Nissan presented Pivo the world first car with a robotic interface. A concept that looks very similar to star wars D3BO space droid and not to far from Jibo. The Robotic Agent in these pictures is a sort of friendly companion that take care safety and other travel related actions. Nissan claims that this multifaceted sensor will be capable of voice command (voice enabled GPS for example) and biometric facial recognition. A “mood detection algorithm” should understand if the driver is relaxed and heedful, trying to engage the user and shift the mood when needed. The robot takes also care of driver’s eyes blinking, preventing weariness. Pivo and the “agent” still in “concept” mode while time is passing, but we have others and most recent example. Kirobo, which stands just 13.4 inches tall and weighs about 2.2 pounds, is programmed to communicate in Japanese and keep records of its conversations with Wakata, the first Japanese astronaut to command the ISS. Kirobo is the world’s first talking robot astronaut. …and Yes, it looks similar to Astroboy. ok… perhaps these last examples we are moving from “connected objects” to Robots, but I personally think it make sense. Exactly because Robots are starting to discuss with us, we might consider the early words, numbers, dashboard, provided by our connected objects like “stories”. If –as designers and technologists- we consider that objects are talking to us, we might provide an additional effort in making them better equipped to tell us their stories. As good listeners we might find a potential value where others are simply seeing noise, innovating products and creating more value. Last but not least, we should think in a broader way respect the next generation of connected device. In fact, I believe that –while technology evolves- we might design our next “iPhone” as an autonomous companion, “linked” with each of us by a emotional connection. Far away from automatic storytellers and robots, evolved to sidekick.